This was mentioned at one of the recent conferences in which Glitzkoin participated. Since the crowdsale ended in June, the tech team has been at work in developing DiaEx, the first diamond marketplace backed by industry veterans. In this time, this question has been asked time and again, about why we chose Stellar for our platform rather than Ethereum, which is currently the most popular platform for blockchain projects. The reasons are threefold - ease of transacting, built in exchange and ease of scaling. The stellar blockchain has been built primarily as a payments network that facilitates cross border transactions - quick, reliable and cost-effective. These values resonate with our mission here at Glitzkoin. We are trying to reduce the friction that is currently present with all diamond transactions. The average time taken for completing a transaction is barely 5 seconds on the Stellar network and is around 3.5 minutes on the Ethereum network. This speed of transacting is something that we value highly, especially when we are looking to create a diamond marketplace that will be used by multiple stakeholders across the diamond supply chain. Stellar is also cost-effective. It only costs 1 cent for 100,000 transactions, as there are no fees that need to be paid to third party exchanges. Whereas, Ethereum transaction fees can go crazy as seen in recent gas wars. The most attractive feature of Stellar is its built in exchange. We wanted to give our investors and bounty participants the ability to trade their tokens from day 1, rather than waiting for us to get listed on other third party exchanges. An in-built exchange, would also ensure that transactions on our platform are more reliable, and not dependent on other exchanges for settlements and payment confirmations. Ethereum has established itself as the number one development platform through accessibility and ease of use. But this is a double edged sword. Due to its benefits, more and more blockchain projects have been deploying their smart contracts on the ethereum network. This has contributed to an increased congestion in the network and created many scalability issues. This was noticed in January 2018 with Bitstamp and Kucoin informing their users of the delay and asking the to use NEO instead. With the bear market and decreased usage, these problems were temporarily solved, but it did raise questions about the platforms capabilities. 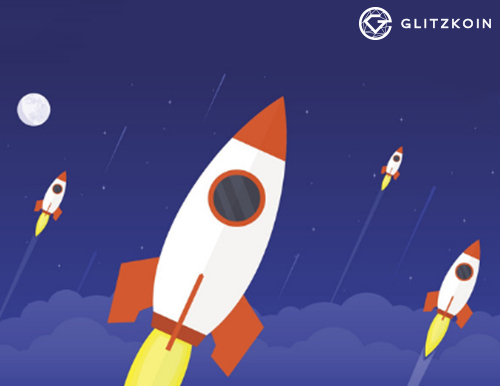 We here at Glitzkoin are looking to capture at least 3%-4% of the $90 Billion diamond industry on our platform by the end of 2019. Keeping our targets in mind, we felt that we needed to future proof our product by associating ourselves with a fast and reliable blockchain network, which is Stellar. Our Diamond Marketplace, DiaEx, is currently in development, and will be live by October of this year. We are already working with high profile diamond traders around the world to ensure that the platform would have a massive inventory and would allow any user to safely start investing in diamonds as an asset class. Follow our Telegram Channel for regular updates.